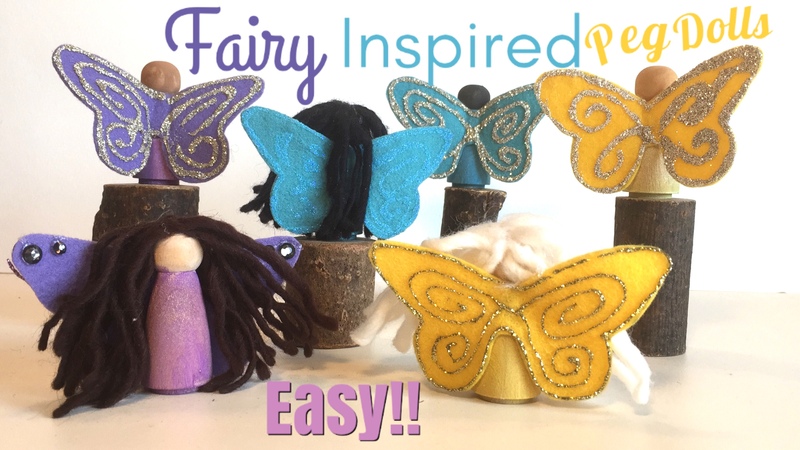 Fairy peg dolls are some of our favorite peg dolls, but there’s one major challenge when doing these. Because the wings are so prominent and take up so much room, they usually compete with the hair. For that reason, painting on hair is an option. While I do like the ones with painted hair, I do like the hair better, but the hair gets in the way of the wings! It’s a circular problem. Maybe I need to learn how to make fairy buns. All the supplies for this project except the glue, glitter and bling can be found at A Child’s Dream. I used the Spring Blossom Holland felt in yellow, purple and blue, Lyra Opaque watercolors, flared peg dolls and Lamb’s Pride wool yarn in white, black and brown. If you liked this tutorial, you can check out more peg doll tutorials and finger puppet tutorials. And the paper butterfly was made for a life cycle of a butterfly project, but it’s come in handy for this project, although free-handing a butterfly isn’t hard to do.